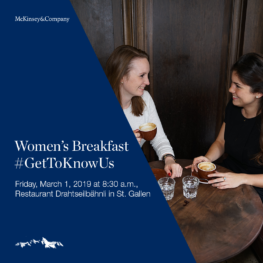 During the McKinsey Women’s Breakfast, partner Alexandra Zemp will share her experiences and how she dealt with difficult situation in her career. This will be a good opportunity to reflect on your own goals and career path. While enjoying the café’s cozy atmosphere, McKinsey consultants will offer you insights into their day-to-day lives and discuss any questions you might have. Application: please send your CV to events@universa-unisg.ch by February 23, 2019. Students in their second semester or higher are welcome to apply. If you would be interested in a CV check please note in your application.